Celebrate your wedding day with majestic bouquets that are rich in color and texture, reflecting the beauty of the fall and winter seasons. We asked four St. Louis florists to come up with a medley of bouquets capturing the charm and elegance of the season. The jewel-toned colors of fall offer a spectacular palette of rich hues and beautiful foliage. 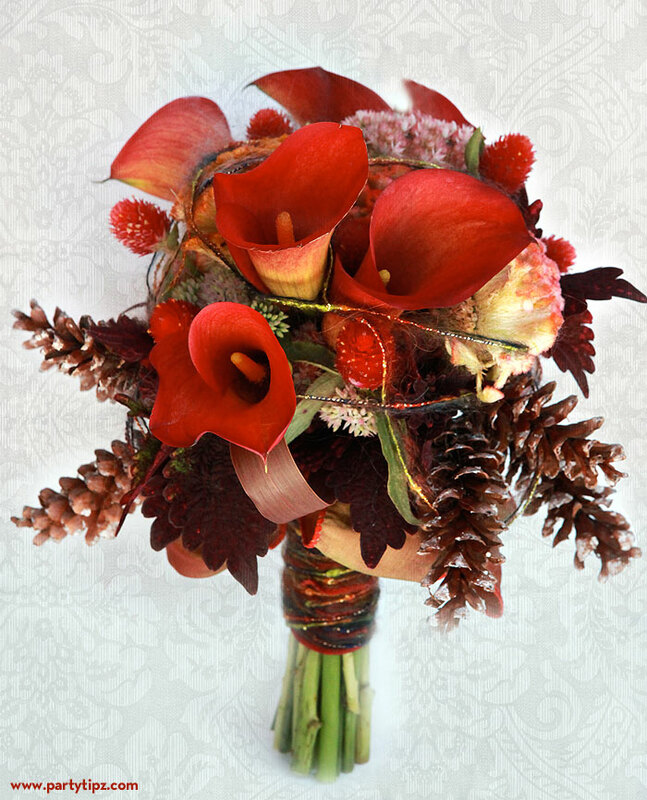 Bouquets designed for the season can take advantage of and indeed tame this profusion of color with various structural techniques. From the controlled and uniform bouquet to a relaxed “just picked from the garden” look, our florists created illustrative bouquets using flowers that can be found at any time of the year, even in the deepest part of winter. To personalize your bouquet design, simply add beautiful accessories and stem wraps. Acorns, ribbon, yarn, and even fabric can add visual interest and a unique twist to your design. As a final note, choose florals that will last well into the evening regardless of the temperature, especially if you are planning to preserve your bouquet after the wedding as a memento of your beautiful day. 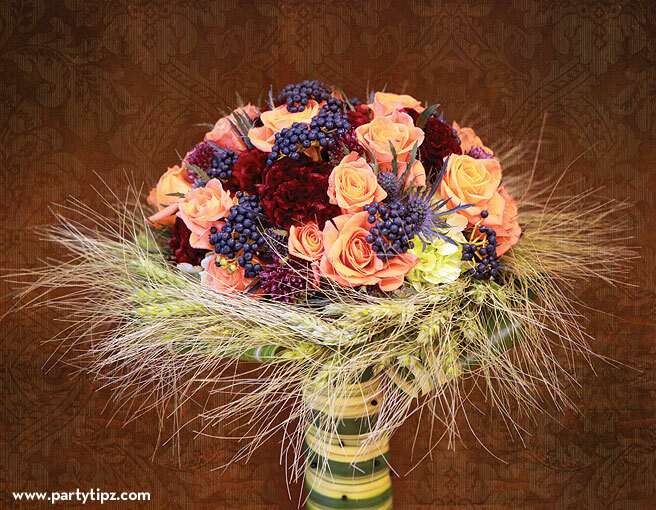 PICTURED BELOW: Unique fall bouquet with a plethora of flowers and a collar of flax. Stems are wrapped in ti leaves and secured with black pins. Bouquet by Petals Galore. 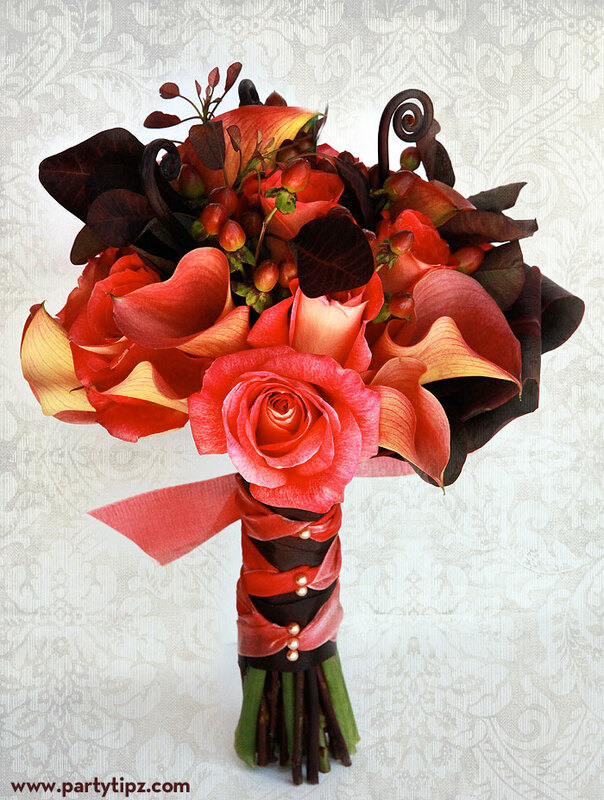 PICTURED BELOW: Fall-inspired bouquet with calla lilies, Hypericum, roses, and other elements. Stem wrapped in two types and shades of ribbon, secured with pearl pins. Bouquet by Belli Fiori. 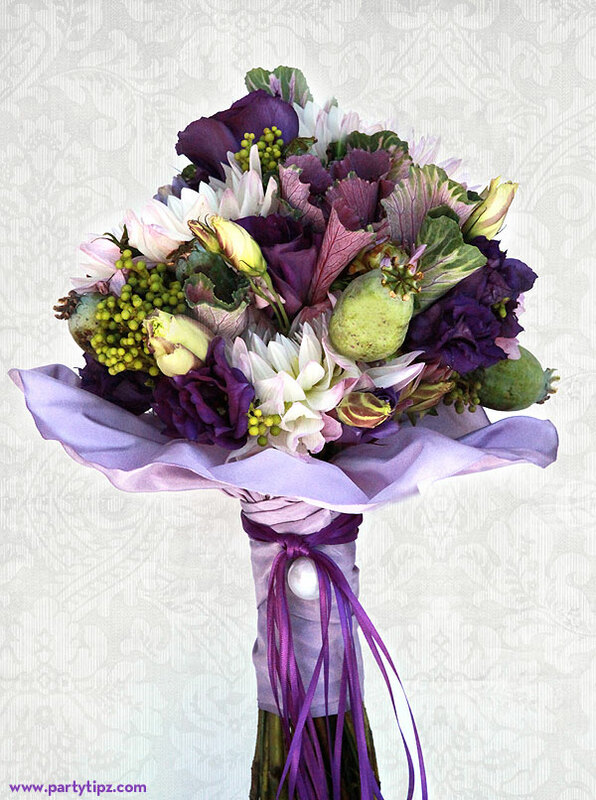 PICTURED BELOW: An elegant fall-inspired bouquet with a unique stem wrap that includes fabric, ribbon, and a large pearl. Bouquet by Wildflowers. 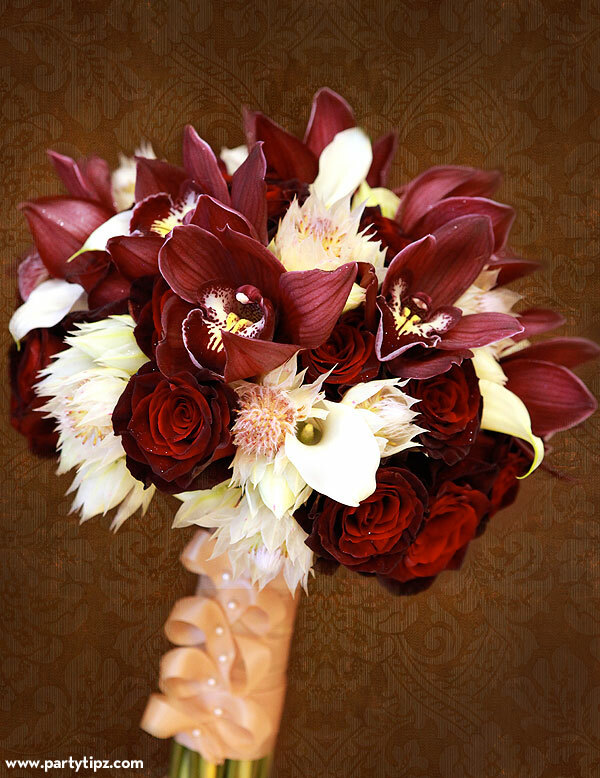 PICTURED BELOW: Stunning winter bouquet with Cymbidium orchids and black magic roses. Stems wrapped in double satin ribbon and secured with pearl pins. Bouquet by Petals Galore. PICTURED BELOW: The stems of this gorgeous holiday bouquet are wrapped in colorful wool yarn which is also woven throughout the bouquet. Bouquet by Thorn Studio. 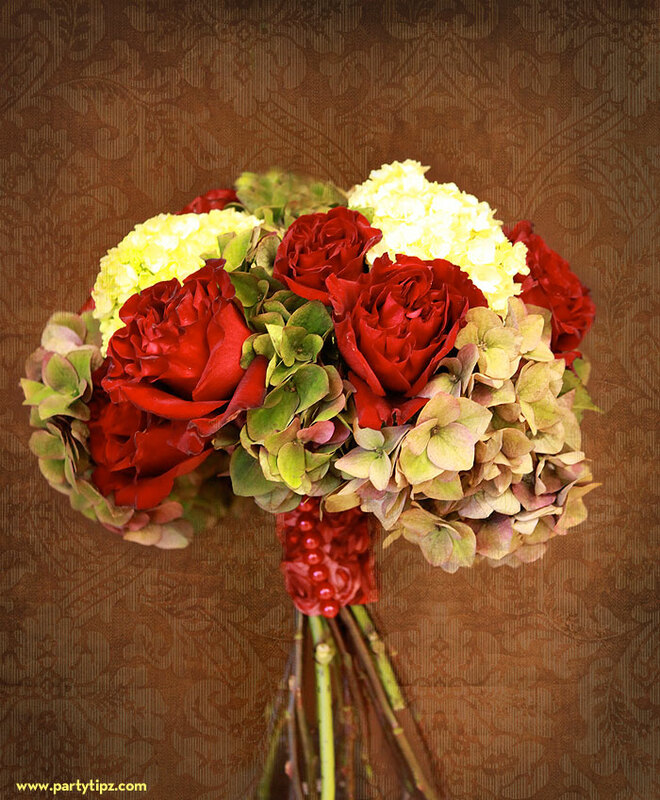 PICTURED BELOW: Holiday-inspired bouquet with red roses and green hydrangeas. Stem wrapped in red ribbon. Bouquets by Wildflowers. 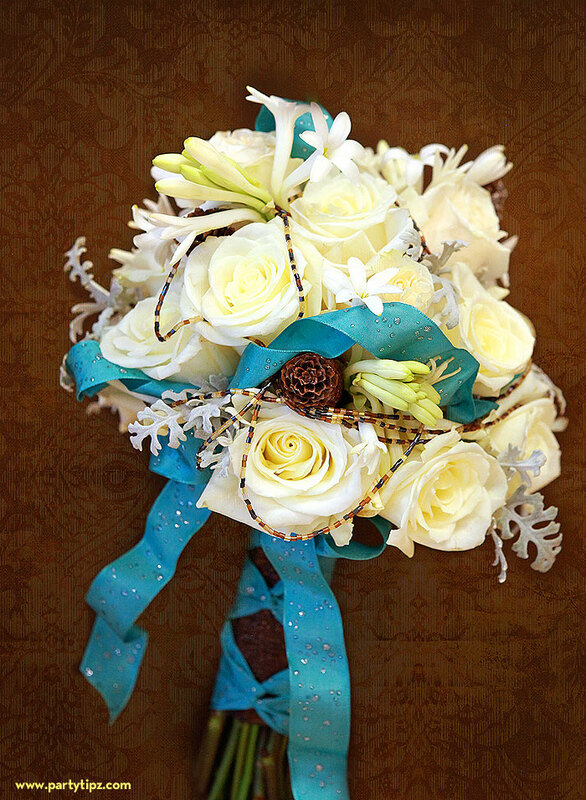 PICTURED BELOW: A winter-inspired bouquet with ribbon and beaded string woven throughout. Bouquet by Thorn Studio. 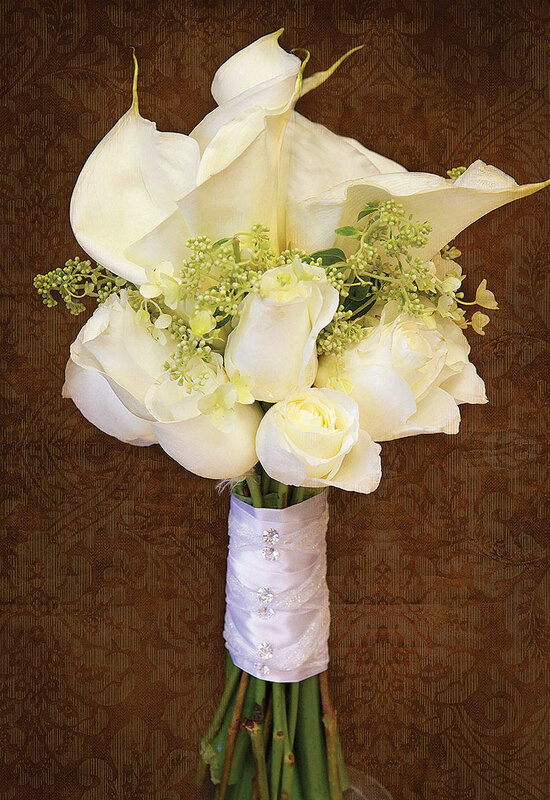 PICTURED BELOW: Winter white bouquet that includes large calla lilies and roses. Stem is wrapped in ribbon and secured by crystal pins. Bouquet by Belli Fiori.